For now, the hardliners on Cuba have won, despite earlier optimism on tourism opening up. The Obama administration has done the backtrack, and the tourists and Cuban economy are the losers. When the Obama administration loosened travel restrictions to Cuba, the thought was that Americans were going to pour into the forbidden island on legal cultural exchanges. But if backers hoped to foster greater understanding between people on both sides of the Cold War’s longest lingering disputes, critics saw an opening for rum-slurping beachgoers to toss around dollars and prop up the communist government. They wanted it stopped. Score this round for the critics. Tourists on the streets of Havana, Cuba. Photo by Space Ritual. Several U.S. travel operators complain that, just over a year after the U.S. re-instituted so-called people-to-people exchanges to Cuba, applications to renew their licenses are languishing, forcing cancelations, layoffs and the loss of millions of dollars in revenue. Many say that’s due to a deal struck between the White House and a Cuban-American senator, something the lawmaker’s office proudly acknowledges. The new requirements, which went into effect May 10 as many yearlong licenses were coming up for renewal, have forced travel operators to fill out piles of paperwork to justify their itineraries, and provide painstaking details on visits already taken. “We have to essentially justify every minute of every day as a legitimate people-to-people activity,” said David Harvell of the New York-based Center for Cuban Studies. He said his group’s renewal application, still unfinished, runs several hundred pages, and the extra paperwork has forced cancellation of six upcoming trips. The dispute comes down to the nature of the visits allowed by law. American tourism to Cuba is prohibited by Washington’s 50-year economic embargo, but U.S. citizens are allowed to come on religious, educational or cultural visits so long as they are covered by a license. 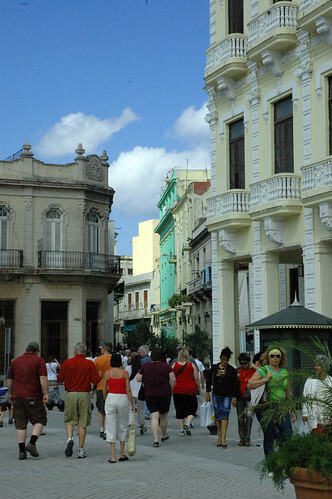 The Obama administration reinstated people-to-people exchanges in April 2011, and the U.S. Treasury Department’s Office of Foreign Assets Control, which enforces the embargo, has granted travel operators 140 licenses for everything from tours of Cuban schools to visits to cigar factories and musical venues. Key requirements are that the trips give participants a chance to interact with ordinary Cubans and that they be educational in nature. That means seminars and workshops rather than salsa and mojitos. But critics say many travel operators have abused the system. Insight Cuba, which has brought more than 2,000 Americans here since the summer of 2011, boasted itineraries including a “Havana Jazz Experience,” an “adventure into Cuba’s enthralling music and art scene” and tours of the island’s scenic tobacco country. That brought the group a rebuke from Sen. Marco Rubio, a Florida Republican, in a speech on the Senate floor in December. The Cuban-American called the people-to-people program a “charade” that “borders on indoctrination of Americans by Castro government officials,” and demanded the Obama Administration enact stiffer controls. “This is nothing more than tourism. This is tourism for Americans that, at best, are curious about Cuba and, at worst, sympathize with the Cuban regime,” Rubio said. It is not clear how many Americans have taken advantage of the people-to-people exchanges, but the number is certainly in the thousands. Tour operators say Rubio’s claims are unfair and will hurt ordinary Cubans, including new entrepreneurs who have taken advantage of a limited free market opening under President Raul Castro to set up private restaurants and other small businesses. Popper said his organization has been forced to lay off 22 full-time workers and has lost millions of dollars while it waits for a new license. More than 150 trips the nonprofit planned over the next 12 months have been imperiled. Other groups awaiting Treasury Department decisions on licensing include the Smithsonian Institution, The National Geographic Society and Stanford University’s alumni association. John Sullivan, a Treasury spokesman, told The Associated Press the department is working as fast as it can on license applications. While he did not credit Rubio’s pressure, Sullivan said the new requirements were enacted because of concerns that some past travel did not meet Treasury regulations, adding that organizations with extensive operations in Cuba will have more paperwork because they must provide details on more trips. “The people-to-people program remains robust and we are working to turn around the license applications we have received as quickly as possible,” said Sullivan. Another Treasury spokesperson, Hagar Chemali, cited the Trade Secrets Act and other confidentiality restrictions as reasons she could not provide details of specific license applications. But she gave several general examples of activities that would not be allowable under the people-to-people program, including visitors walking freely along Old Havana’s cobblestone streets or paying a call on a farmers’ market. Several people-to-people groups and alumni associations did get licenses renewed in June, after the new regulations went into effect, and reported a relatively straightforward process. Shortly after that, Treasury officials began telling license holders to expect delays due to summer staffing issues, and simultaneously began demanding more paperwork for renewal, according to several people involved in the application process. “The license holdup, it’s really a freeze since July 1,” said Bob Guild, vice president of Marazul Charters Inc., which operates charter flights to Cuba and has helped organize many of the exchanges. Sullivan denied there was any hardening of OFAC’s stance since July, and said some licenses had been approved since then. He said he was not authorized to speak of specific cases or give an overall number. For the people-to-people operators, continued uncertainty over the licenses is starting to bite. High-season in Cuba begins in mid-October and runs through April, and trips generally take a couple of months to organize. He and other people-to-people operators scoffed at critics who allege that the trips amount to pro-Castro propaganda, noting that travelers often remark on how open Cubans are in speaking of their hardships. Peggy Goldman, the president of Friendly Planet, another group awaiting a license renewal, said the exchanges do as much to teach Cubans about the American way of life as the other way around. Associated Press reporter Christine Armario in Miami contributed to this report.